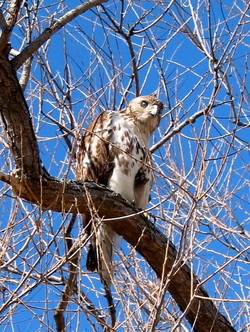 The Lakeshore Nature Preserve provides opportunities to view a wide variety of birds in a relatively small area. The Preserve provides diverse habitat, allowing the support of many kinds of birds. The Preserve has woodlands (Picnic and Frautschi Points, Eagle Heights Woods), marshes (Class of 1918 Marsh, University Bay Marsh), open water (Lake Mendota, University and Second Point Bays) and prairie and open lands. Over 255 bird species have been seen in the Preserve over the past 25 years. Most birds that regularly occur in south central Wisconsin have been found in the Preserve. Birding in the Preserve is best during migration. Migrants can be found anywhere in the area. Even though the Preserve is best known for its migration, it supports a diverse breeding bird population as well. During the 2000 to 2002 Breeding Bird Study, 69 breeding bird species were confirmed. In 1999 we compiled a six page Lakeshore Nature Preserve Bird List (available on the Friends Web Site or from Roma Lenehan) using the data of many bird watchers and ornithologists. The long-term data of Jack Hailman's Chickadee study, the observations of the Field Ornithology classes, the Wildlife Ecology class surveys, and the 1918 Marsh studies contributed significantly to this project. In addition, Madison Audubon and the Wisconsin Birding Network (Wisbirdn) members contributed data. In 2000 and 2001 we continued to collect data for the Bird List. Most significantly, we added data from the 2000 and 2001 Breeding Bird Study (see under Breeding Bird Study). In the fall of 2000 on a bulletin board in the Eagle Heights Gardens we established a Bird Sightings Board for bird watchers to record their sightings. In addition, we produced a shorter, single page Lakeshore Nature Preserve Bird Checklist that we continue to make available to interested birders and classes including the 2001 Field Ornithology classes (available on Friends Web Site). This short Preserve Bird Checklist is also posted on the Bird Sightings Boards. The Lakeshore Nature Preserve Bird List includes 253 species of birds that have occurred in the Lakeshore Nature Preserve in the last 25 years. At least 220 bird species were seen in the Preserve between August 1999 and August 2001. Thus, more than eighty-five percent of the Bird List species have been observed in the past two years. Some of the 33 species of birds not observed during this period are rare or accidental birds. Other bird species are irruptive species, like the winter finches, which occur only infrequently when a lack of food forces them south. In 2001 we continued to collect data for the Preserve Bird List. In addition to the Bird Sightings Board at the Eagle Heights Gardens, in April we put up a Bird Sightings Board by the entrance to Picnic Point (on the back of an athletic board by the service entrance). The new location is more useful because most bird watchers never get to the Eagle Heights Gardens. In the first week 11different people entered a total of 46 birds of 32 different species. The spring semester Field Ornithology classes also recorded their sightings and used the Bird Sightings Board to locate unusual birds such as the May 7 Hooded Warbler. The Bird Sightings Board allows us to monitor changes in the bird species that are present in the Preserve on a daily basis. Already several rare birds including Merlin, Orchard Oriole and White-eyed Vireo have been reported this spring on the Bird Sightings Board. We continue to maintain the two Bird Sightings Boards, to monitor the Preserve bird reports on Wisbirdn, the Wisconsin Society of Ornithology’s bird watching list served, and to encourage local bird watchers to submit their sightings. As we continue to collect data, we expect the Lakeshore Nature Preserve Bird Checklist to become more accurate.